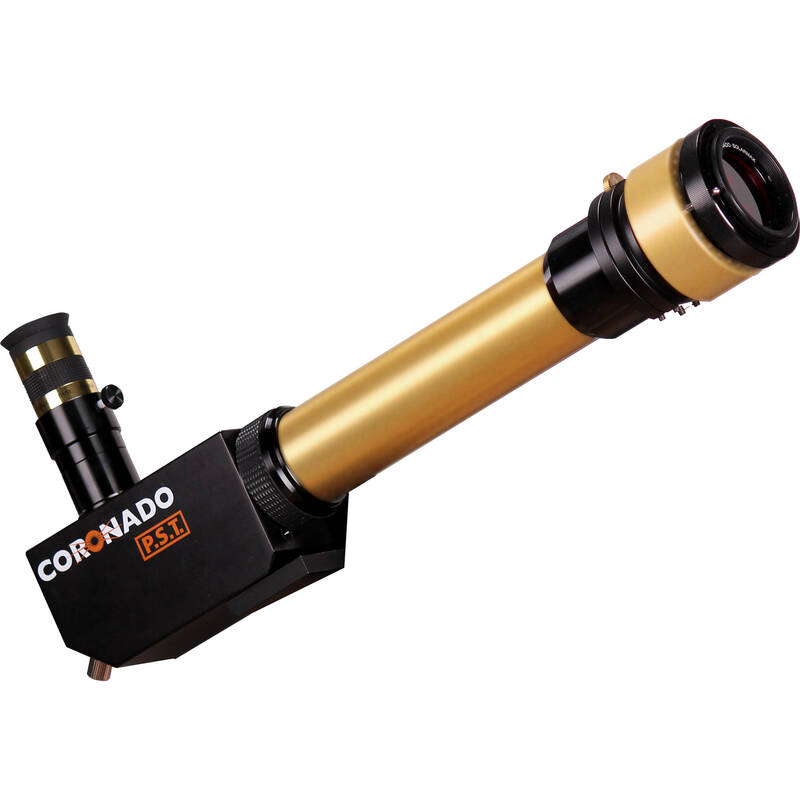 Coronado's iconic PST 40mm f/10 0.5Å H-Alpha Personal Solar Telescope optical system is tuned to the hydrogen-alpha bandwidth with a 0.5Å (Angstrom) bandpass for viewing details of the Sun's chromosphere (surface) and prominences. A bandpass tuner allows users to compensate for Doppler shift or to highlight specific areas or zones. It is designed and engineered to be set up quickly and used easily. The 40mm external etalon has an easy-to-use tuning ring, while the 30mm etalon primary blocking filter is set internally, so all users need do is mount the OTA on a stable platform and drop in the included 20mm eyepiece. The PST is offered here without a mount or tripod, but it is equipped with a standard 1/4"-20 tripod mount for using conventional photo/video/field tripods, or it can be mounted on many alt-az, EQ, or motorized astronomical mounts. Aperture 40 mm / 1.6"
40mm f/10 0.5? H-Alpha Personal Solar Telescope (OTA Only) is rated 5.0 out of 5 by 2. Rated 5 out of 5 by Chris from The perfect entry to H Alpha! This is the scope to get if you don't already own other telescopes and want to get into H Alpha viewing (or imaging!) For the price nothing will come close. It has no issues with brightness, even double stacked thanks to a black air gap tuner attachment that is included with the second etalon. You can get a nice, evenly bright disc, or concentrate light and contrast to a specific area! I did find the view angle is pretty narrow, so you have to keep your eye centered very well. With time I think you could get used to it, but I found much more enjoyment using a small 1.25 camera (QHY5L-II) Using a camera I was surprised how much detail there is in surface even without the second etalon! Using the PST double stacked is certainly an improvement but it does take some work getting both etalons and the gap tuner dialed in for maximum contrast. All in all, this is a very impressive h-alpha scope for a very impressive price! Rated 5 out of 5 by AfricanAdventurer from Excellent Telescope - Accesories Require I've traveled abroad with the litte solar scope in my carry on. Excellent quality and durable. Beware that you need to purchase all of the accessories as well. The case, mounts, etc. What is the country of manufacture? Where is this made?